Got a Problem with Tree Roots? 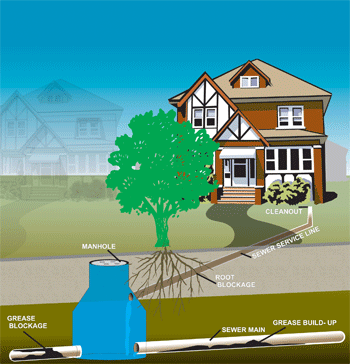 Tree Roots are the most common cause of sewer problems followed by feminine products and grease. Do these items cause damage to the pipes? Not if you perform preventive maintenance every 1-3 years. Roots grow in through the joints of the pipes where there aren’t any gaskets to keep them out. Roots go through the pipes looking for water and end up finding water and fertilizer which keeps them coming back. Some property owners have stated that if the tree roots are cut properly the first time, they are likely not to return. However, that is not the case. ( Yeah right ) Imagine eating at a local affordable restaurant that served an excellent five course meal, would you only go once? Others have suggested that by cutting down the tree. They will get rid of their plumbing problem .The price for cutting down trees can range from $1,500 – $10,000 depending on the size of the tree and it’s location on the property. Unfortunately, tree roots will grow for 7 to 10 years after the tree has been cut depending on the type of tree, the water table, and the climate. This would be an unnecessary expense especially if the owners did not plan to stay in the house long enough to reap the benefits. Sadly this process is not refundable nor will you be able to add this to the sale price of the house when that time comes. Maybe when the market is high but presently it is not, you would lose money. Maintenance for controlling your tree roots is very important. When the tree roots go from strings to branches, it is likely that they will start to break the pipes and cause humps in your sidewalk.